Each of us is a student in the school of life! We are mirrors and teachers for each other. What we see in another, which we do not like, or which annoys us, is what we need to look at within ourselves. It is an aspect of ourselves being brought to our attention. When we see those around us as mirrors, and that they are only here to assist us to achieve soul growth, then our relationship with them becomes a learning experience. If we take time to understand this, our life will become so much easier. When we do so, we truly become spiritual. This affirmation is designed to assist you to understand the true nature and purpose of your relationships with others. By saying this affirmation, you are consciously working on yourself, and your relationship with others will reflect your change positively. The more you say the affirmation, the more positive change will take place in your life. It will not happen overnight, but slowly and surely, you will see the change. 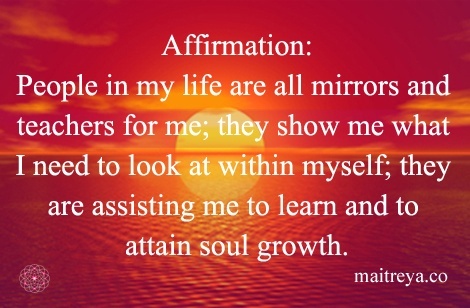 You can repeat the affirmation as many times as you can. The more you say it, the more positive reality you can manifest in your life.